Soulful singer-songwriter Amos Lee is one those artist whose unique sound blurs every genre tag you try to stick on him. Is it folk, blues, Americana, jazz, alt-country, gospel, roots rock? Thankfully his voice and his songs are so good that the labels don't really matter at all. After four amazing full length albums, you can just say the name Amos Lee and you know what kind of rich smoothness you're going to get. This is definitely the case with As The Crow Flies, Amos' new EP that comes out 2/14 on Blue Note Records. Featuring six songs that were recorded during the sessions for last year's critically acclaimed Mission Bell album, As The Crow Flies continues on in the dusty, laid back vibe created my Amos' relaxed songwriting and the sonic touch of producer/multi-instrumentalist Joey Burns (Calexico). Every song is built around the acoustic guitar and is supported by some of the most gorgeously unencumbered playing that perks the ears without ever demanding attention. Add Amos' bluesy, emotive voice on top and you've got a recipe for one of the most layered and textured releases of the year. As The Crow Flies kicks off with the atmospheric "The Darkness," showcasing Amos' ability to get a little brooding, though still encouraging that "we all fall into the darkness before the dawn." Adding to the beautifully morose feeling are some elegant strings, dense percussion and some great fuzzed out electric guitar, courtesy of Amos himself. "Simple Things" features a finger-plucked acoustic and some simple piano and glockenspiel lines that really allow Amos' voice and note selection to really shine. There's also some great Weissenborn slide guitar on this track, courtesy of veteran studio sideman Greg Leisz. Greg also shows up on electric guitar on the harmony-rich country shuffle of "Say Goodbye" and on Weissenborn again for the folky "May I Remind You." "Mama Sail To Me" is another finger-plucked acoustic ballad where the lush background instrumentation just swells and breathes around Amos' voice, continually reminding you what is so special about it. 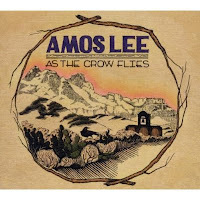 As The Crow Flies closes out with "There I Go Again," a rousing organ-fueled number that really highlights Amos' ability to combine moods and instruments in a way that creates something wholly and uniquely him. It's folky and funky and never strays into any odd or confusing areas. Many artists try to do this same thing and many artist just create an unfocused, musical mess. Amos really shows how it can and should be done; genuinely, authentically and most of all pleasing to the ears and heart. As The Crow Flies is not only just a great companion EP to Mission Bell, it also stands on it's own as a collection of Amos' particular brand of expressive, soothing songwriting.